Despite some apparent advantages, most carpeting industry professionals advise that installing carpet over carpet is not a good idea for several reasons. By leaving a layer of carpet, you make it that much harder to nail down the tack strips (the long, wooden strips around the perimeter with upward-pointing spikes). The anchoring nails on tack strips run about 3/4 inch long, which is far too short to penetrate the old carpet plus a pad (if the carpet has one) and drive into the subfloor. In fact, the difficulty of placing tack strips may be the single factor that prevents you from laying new carpet over old carpet. Carpeting needs a solid base for proper installation and performance. Carpet installed with an improper base will wear out quickly. There are many aspects to this, but consider just this one: Traffic patterns already worn into the existing carpet will quickly be transmitted to the new carpet. Studies show that mold and mildew in carpeting are exacerbated by the presence of dirt. Dirt and moisture, with high temperatures added, equals mold and mildew. It is virtually impossible to clean an old carpet enough to remove all of the dirt. But if you choose to have the old carpet professionally cleaned first, you're already spending money that could have been spent on removing the carpet. By adding an extra layer to your flooring, you are effectively lowering your ceiling. If this is a basement or any other height-challenged room, every inch counts. Don't forget that adding height to your carpet will mean that doors will scrape and thus will need to be cut off at the bottoms. Also, wood trim will have to be removed and reinstalled. Ripping up carpet lets you assess the status of your subfloor and identify and repair any damage to it. Here are some final considerations that might convince you to remove the old carpet rather than doubling-up carpet layers. Concerned about dumping carpet in landfills? There is a non-profit consortium called Carpet America Recovery Effort that helps connect homeowners to companies that recycle carpeting. If your reason for leaving the old carpet in place is an environmental concern, a variety of re-use stores may gladly accept carpeting that is in relatively good shape. Even a very old carpet may have good sections that can be cut out to serve small rooms or to make area rugs. Glued-down carpet is notoriously hard to remove, but when it becomes old, the adhesives may have cracked and broken up. Before you assume that a glued-down carpet will be impossible to remove, test a corner of the carpet—you might get lucky and find that it comes up rather easily. If the labor required to remove glued-down carpet is too oppressive to think about, consider using a power tool, such as a multi-tool with a scraper attachment. It's also helpful to have a heat gun to loosen up the stubborn glue. Be very careful when using a heat gun near textiles and carpeting, though. 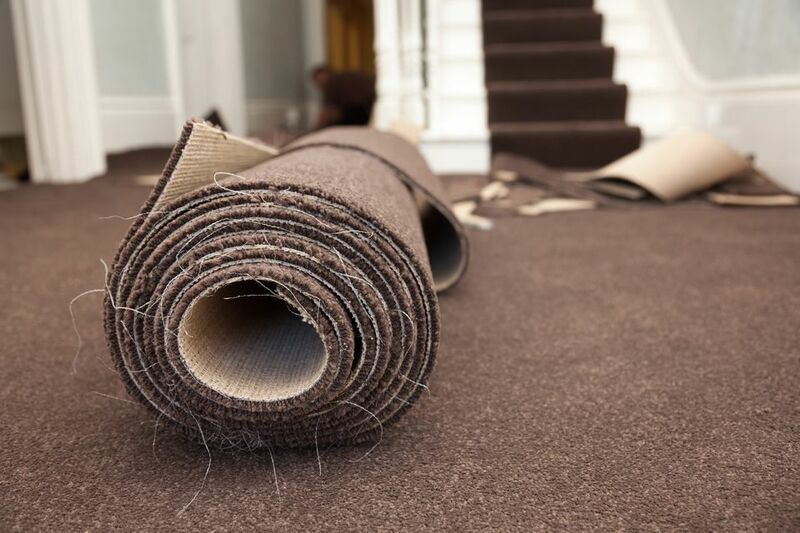 The best choice for a carpet-over-carpet installation is a carpet with extremely low-pile. The lower the pile, the better. Lower pile minimizes the degree to which the floor will be raised by adding a layer of new carpet over the old. At best, carpet-on-carpet should be a short-term solution. So, if you are house-flipping or intending to stay in your home for only a short while, this may be a viable option. In fact, placing an area rug on carpeting is also perfectly acceptable. Laying down a thin plywood underlayment atop the old low-pile carpet is better than just putting the new carpet straight onto existing carpeting. The underlayment will provide a rigid base for the new carpet and a place to attach edge tack strips. Make sure to securely nail the underlayment down to the subfloor through the old carpeting.